4.2 Copy the public key to the computer you want to log in to. Never, ever, use telnet. Ever. Or ftp. These programs send you password through the aether as clear text, opening you to exploits by all kinds of nefarious evildoers. Instead, learn to use ssh, scp, and sftp. Try -X first, as it is more secure. If there are problems, try the -Y option instead. Problem solved (at least for me). Your identification has been saved in /Users/yourname/.ssh/id_rsa. Your public key has been saved in /Users/yourname/.ssh/id_rsa.pub. Copy the public key to the computer you want to log in to. (but do this only if ~/.ssh/authorized_keys does not yet exist, or it will clobber the file rather than append to the bottom of it. It should now be set up for passwordless secure login. The idea of how to establish and use ssh tunnels, and why you might want to do this, is best illustrated with some examples. I have chosen two examples that you might very well want to put to use: Using a web proxy to access restricted websites (like scientific literature your library has a subscription to), and connecting to a mail server from anywhere, even if your local service provider tries to prevent this (DSL home service providers, hotel internet, etc). Problem: I want to read restricted-access journals from home, but I only have access from work. Solution: Configure Firefox or SeaMonkey to use your work computer as a proxy. For example, I can access most scientific journals on-line from machines that have recognized IP addresses (i.e., are affiliated with our university, whose library has paid for on-line access). If I am at home or on the road, I cannot do this easily unless I use a proxy server. Fortunately, this is fairly easy to do. Choose a port, 8080, or any un-used non-root port. 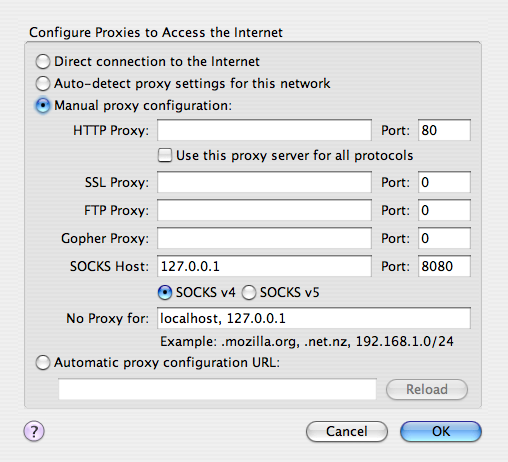 The -N flag says to establish the connection but not to make it a login shell, and the -D flag says to use dynamic port forwarding with ssh acting as a SOCKS server. On Mac OS X, I use Safari as my primary web browser, but I keep several on hand. Because of this, I can dedicate FireFox as my proxy web browser. If FireFox is your primary web browser, other browsers in the Mozilla family, such as SeaMonkey, have this capability as well. Thanks very much to James Davis and Adam Smith of UCSC SOE for the tip. Problem: I want access to my email securely from any connection point in the world. Solution: Configure smtp and pop or imap SSH tunnels. then just subtitute what you would actually type for this to the right of the -N option flag in the above two tunnel commands. 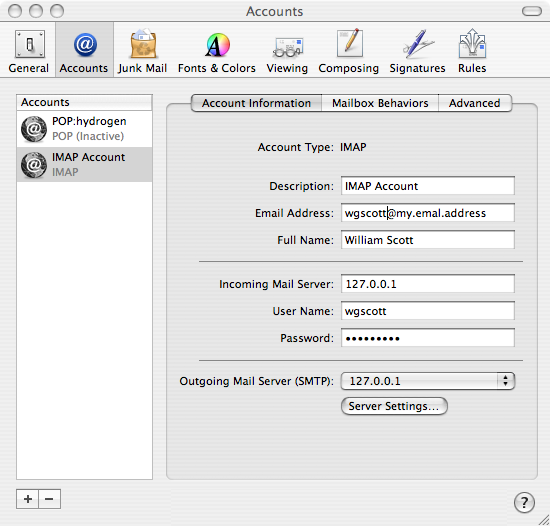 (These are the same names you put in the email program for POP3 mail server and smtp server, respectively.) The ports (110 and 25) are the (insecure) ports used for POP3 and smtp mail. (If you are using the ssl secure ports, there is no need to be doing this). Again, these are the same as you used for configuring mail. The -N flag says to establish the connection but not to make it a login shell. Don't change ``localhost." The other two ports (1110 and 2525) are arbitrary choices. You can pick any (unused) port (although the ones below 1024 are reserved for root). The -L flag tells ssh to do port forwarding (i.e., to establish the tunnel, treating the local port 1110 as if it were the remote port 110). The (optional) -C flag is for compression. This is handy on a lower-speed connection, but might actually slow stuff down on a high-speed connection. 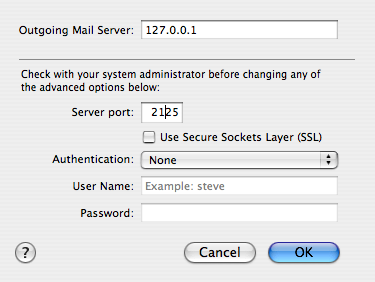 To get Mail.app to use your ssh tunnels, you have to reconfigure its settings. First, establish the above tunnels. Then go to Advanced tab, click on it to reveal the new pane, and enter the port 1110 (or whatever you picked for the first tunnel). You should now be set to collect and send your mail via ssh tunnels. If the tunnels become interrupted, you will have to re-establish them. I find that it is easy to start and maintain the tunnels using a simple free gui application called SSH Tunnel Manager. This saves you typing and remembering the above commands. Should you require permanent, always-on tunnels, it might be better to run a launchd item to do this. This page was last modified on 23 September 2016, at 04:22. This page has been accessed 103,648 times.